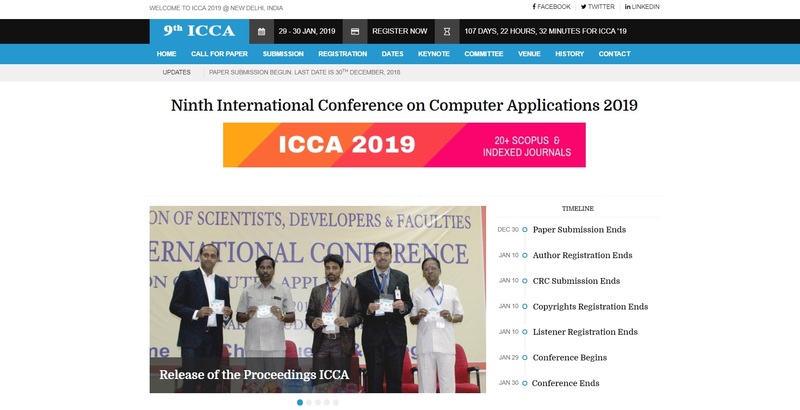 The 9th International Conference on Computer Applications ICCA 2019, aims to bring researchers, scientists, engineers and research scholar together to exchange and share their experiences, new ideas and the research outcome of all possible aspects of Computer Applications in Database, Networks, Telecom and Management. The networking has been experiencing a drastic development these days; networking is a segment which can’t be operated especially without the impact of Computer. The second is the telecom industry, where each and every nodal and cluster operation are managed using the computers. The third is the management, without management, it’s difficult to run a computer application and is vice versa. So, considering the recent advancements and others the conference tiled has been selected. ICCA 2019 ONLY accepts unpublished research papers in English. Submitted conference papers will be reviewed by technical committees of the Conference. All accepted papers will be published in the conference proceeding by Association of Scientists, Developers and Faculties and indexed by EDLIB which in turn indexed by other major indexes.